Are you looking for the best birding binoculars? Bird watching is a relaxing and rewarding hobby, it as an activity is very satisfying as it gives you a great way to enjoy the best of nature. Those small birds perched on the branch of a tree are what we all dream to see and enjoy in all its glory. And, binoculars make seeing the birds up close even more exciting. So, what are the best binoculars for birding? Also like binoculars for hunting, finding good binoculars for bird watching is not difficult, but there are some things you need to know before you buy. We should address one of the most significant aspects of this challenge, namely how the best birding binoculars vary with the type of person using it. Your choice of binoculars will change if the ecosystem is a lake compared to one that can be used in dense woodland regions. Keep such concerns on the top of your list as you read all you need to know about the best binoculars for birding. A pair of binoculars is nothing without magnification. This is the soul of the device; after all, you even get binoculars so you can see your target up close. The Power or Magnification measurement is the degree that the object being viewed is enlarged. In the case of bird watching, zooming can make all the difference between a fruitful expedition and wasted effort. Magnification helps get the bird in your sight range and displays it close enough for you to spot telltale distinctions. In this example, binoculars with an 8 power magnification will magnify the object 8 times larger than would normally be seen with your eyes. Despite the importance of magnification, bear in mind that the best binoculars for birding do not always have to come with high magnifying capabilities. Sometimes when you have increased magnification, the depth of focus is consequently reduced. This means you have a duller image overall and a much smaller field of view. Enhanced magnification can often make holding binoculars steady a chore. As a general rule of thumb, a magnification of 8x is quite efficient for a wide variety of bird-watching needs. In the world of binoculars, when you hear the words field of view (FOV) it refers to the width of the image as you see it through the lenses. There is no such thing as too wide a field of view. After all, wide views make birding a lot more fun because you get to see more of the bird as well as its natural surroundings. A wide view can also help you land that perfect ID for the bird you are observing. Immensely helpful for birders observing small birds that perform extremely swift movements, a wider field of view prevents them from losing sight of the bird. You can potentially ruin a good field of view if you zoom in on or magnify small birds. You could easily lose the chance to pinpoint details and trajectory of flight if the bird happens to take wing suddenly. While it is ideal to have the best binoculars for birding, you should never sacrifice field of view for magnification. Simply seek out the magnification that best fulfills your birding needs and then look for a field of view that complements it. Focusing on images during birdwatching is a key element of the game. Birds are no fans of standing still, and this is especially true of the smaller ones. Purchasing binoculars that can quickly and smoothly zoom in and focus on the species you are observing makes things so much better. In fact, this ability to zoom in with your binoculars is as crucial as a wide field of view. To optimize the focusing capabilities of your binoculars, you need to check and test the focusing wheel. Not only should it move freely in both directions, the wheel should also be situated at a convenient spot on the binoculars so it is not hard to reach in an emergency. If you have brand new binoculars and you happen to be unfamiliar with the features, the focusing wheel can at first be a hassle. This is especially true if the wheel is situated on a different spot compared to binocular models that you might already have become familiar with. As long as the wheel is not someplace that forces you to take your eyes off the bird in order to use it, or cause you to shake the binoculars while you adjust the wheel, you will find birding a fun and simple outdoor activity. Your aim is to get smooth transition while focusing the image. A wheel with a nonslip surface can do wonders in this regard. The core technique behind zooming in on a bird is to go as far as you can and then compensate for clarity by gradually zooming out until the bird is in focus. If you have a nonslip wheel surface, you can perform this maneuver without any delay or problems. Modern binoculars come in a vast range of weights and sizes. Any pair that is most comfortable for you is sure to make birding a fruitful experience. If a pair of binoculars feels ‘just right’ in your hands and eyes, then size and weight become irrelevant secondary concerns. Such comfort depends a lot on the type of birdwatching you are involved in, where the birds are, and how you plan to view them. One of the more popular binocular types is compact pairs that come equipped with high-quality magnification capabilities. While they may not have the same numbers as bigger and multi-featured models, compact binoculars often let you view more than what bigger pairs can. This is purely thanks to their simplicity, which makes compact binoculars easier to handle, focus, magnify and move to catch sight of birds. However, there is a reason why larger binoculars are preferred. It is because they pull in more light than their smaller compact cousins. Larger binoculars can shed more clarity through the better light intake than compact birding binoculars. While the ultimate choice is one of personal preference, generally full-size binoculars ranging anywhere from 7×30 to 8.5×50 are preferred and considered the most popular range in magnification and objective lens size for bird watching. 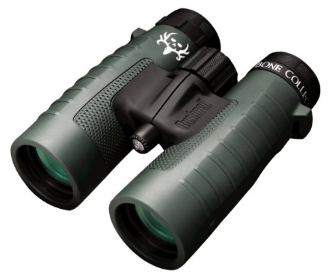 For instance, binoculars with an 8×42 configuration feature a 42mm objective lens size which provides ample light gathering capabilities in even lower light conditions and an 8x magnification allows you to steady the binoculars much more readily than with significantly higher powers, making the task of bird identification easier. Some birders with steady hands may prefer 10 power binoculars or greater. Please remember that as you increase the power of your binoculars, less light will be gathered and therefore the viewing field will be reduced as well. It is also very difficult to keep an image steady at very high magnifications using standard hand held binoculars. A tripod is often necessary to steady an image at higher magnifications. A good alternative though for those seeking the option of high power magnification is a pair of binoculars with a zoom feature. This gives you the option of higher magnifications without the limitations of fixed, high power binoculars that can be a bit unwieldy. Whatever, to fully enjoy bird watching and to sharpen your bird identification skills a good pair of binoculars is a must especially if you want to take your hobby further. You should buy the best binoculars you can afford. A pair of quality binoculars is essential, especially for pro bird watchers.